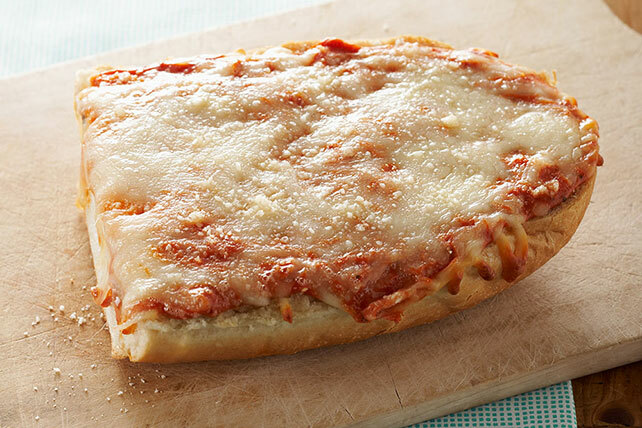 Triple the cheesy deliciousness on your French bread pizza by adding melty VELVEETA to the sauce and topping with both mozzarella and Parmesan. Cut bread lengthwise in half, then cut each half crosswise into 3 pieces. Place on foil-covered baking sheet. Microwave pizza sauce in medium microwaveable bowl on HIGH 1 min. Stir in VELVEETA. Microwave 2-1/2 min. or until VELVEETA is completed melted and mixture is well blended, stirring after each minute. Spread onto bread; top with mozzarella and Parmesan. Bake 20 min. or until mozzarella is melted and lightly browned. When microwaving pizza sauce, cover bowl with paper towel to prevent sauce from spattering in microwave. For best results, use a serrated knife to cut the bread.